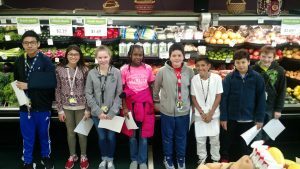 On May 9th, 8 students from Goshen Middle School’s 6th grade New Tech program visited Maple City Market as part of a local business project. Pictured are Javier Reyes, Mia Diaz, Kylee Brown, Fatime Mahamat-Saleh, Isaiah Lugo, Josh Cruz (featured in the video!) , Luis Abad, and Mason Leviner. 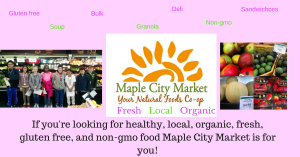 Thank you to teacher Heather Turner at Goshen Middle School, and your 6th grade business team for choosing Maple City Market. We had a lot of fun being a part of your project!